An expert conference on the high-rise building project of Cologne took place in November 2003, organised by the city of Cologne. As requested at the 27th session of the Committee, representatives of UNESCO and ICOMOS were invited to attend the meeting. They gave statements on the issue and were furthermore informed of the approved building plan for the Deutz area. During the panel discussion four points of concern were brought to the attention of the meeting by the UNESCO representative related to the high-rise project and the way it might adversely affect the World Heritage property: the state of conservation of the Cathedral; the need to define effective legal boundaries of the site, including the definition of a buffer zone; the need to consider the site within its environmental and cultural landscape context, wherein the visual integrity of the Cathedral of Cologne as an outstanding feature of the well-known urban skyline should be protected; and the support for urban development at a larger scale provided that adequate architectural solutions are foreseen to avoid adverse effects on the outstanding value of the site. On 29 January 2004 the German authorities submitted an up-date report on the planning situation. The report addresses the four points of concern brought up by UNESCO and ICOMOS, particularly the lack of a buffer zone and the impact of the project on the visual integrity of the property. While the outline of a buffer zone incorporates the historic city centre on the left bank of the Rhine and the river Rhine itself, the master plan for Deutz still foresees five high-rise buildings with the heights of 103 to 120 m situated in the East-ward view axis of the Cathedral. The current master plan of Deutz is part of a general master plan for the city, foreseeing more high-rise projects in other parts of the City of Cologne. 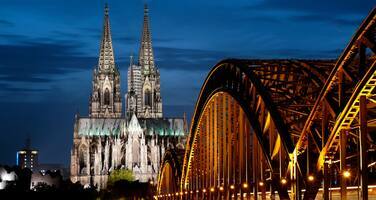 By letter dating 11 March 2004, UNESCO and ICOMOS were invited by the City of Cologne to further discuss the building project. ICOMOS noted that the planned high-rise buildings, especially the group on the Deutz site if built as foreseen, would considerably change the urban scale of the whole city centre and destroy the spatial quality of the World Heritage property Cologne Cathedral. While city authorities are firmly attached to the high-rise constructions and not willing to modify the concept, local preservation bodies, official as well as non-official, raise awareness for cultural values under threat. ICOMOS announced to act with all vigour in favour of preservation of the irreplaceable cultural values of the Cologne Cathedral and it’s setting. It furthermore regretted that the city authorities did not pass full information relevant to the case for debate. While discussing the planning concept, the architectural design of some of the high-rise buildings had already been done due to prior economic commitments. The economic plans for the development and expected outputs are not convincing; the feasibility of the high-rise concept therefore is questionable. ICOMOS clearly stated that the development plans are necessary for the city but the existing cultural values have to be respected. In the case of the World Heritage property of the Cologne Cathedral the height of planned new constructions in Köln-Deutz should be revised. An analytical part of the planning process, if done consequently, will show clearly the negative impact of the project on the whole city. 7. Requests the State Party to provide a detailed report on the situation by 1 February 2005 for review by the World Heritage Committee at its 29th session in 2005.